An interesting movie, that just isn’t quite as thrilling or captivating as one might have expected. This is a pretty goof movie that should have been great. It’s one of those films where the premise is cool and the setup to numerous scenes are fantastic, but the payoff often just isn’t there. What that means is that the scenes build up to something exciting, and we are right there for the ride, during that buildup, but then we don’t get the satisfying resolution to what has been taking place. It happens a handful of times. That and also the movie not giving us enough information about certain things. Other than those two issues, however, this is a pretty good movie. 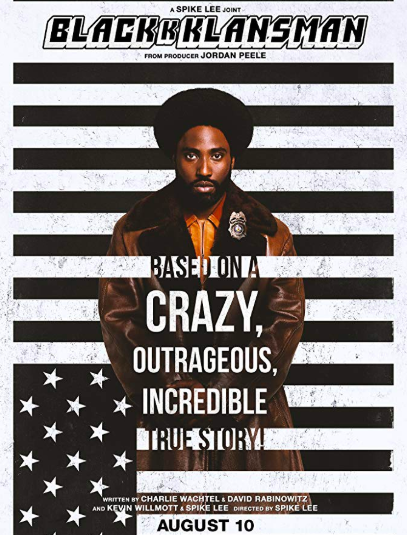 The story is definitely interesting, and in the hands of director Spike Lee, some real messages about racism and the state of our country come out of this one. 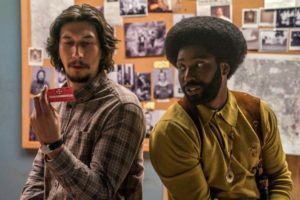 BlackkKlansman is an okay movie. It’s certainly entertaining, but it also leaves a good amount to be desired. This is a Spike Lee movie, and he has made some of his best wirj with films that focus on police detectives, (Inside Man, Clockers.) But this movie doesn’t quite match up. Maybe that’s because of its subject matter, which is more about the Ku Klux Klan than it is about the police. But the real reason why the movie isn’t suite as good as it should have been is because there is a lot of setup, and not quite enough follow through. The movie vie is about this young, black rookie cop, Ron Stalworth, (played by Denzel’s son, John David Washington.) He’s new to the force and trying to make a name for himself. Our first scene with him has him interviewed by two higher ranking officers, about whether or not he will be able to handle the racism that will come with the job. They refer to him as the Jackie Robinson of the police, since there has never been a black officer on the force in this town before. Stallworth gets the job, and at first, the job is working the records room. An officer comes in looking for a file and Stalworth has to pull it for him. And he doesn’t really like the way that every cop refers to the black guy he wants a file on as a “toad.” Stallworth calls one cop on it, and it turns out this cop is a racist policeman who abuses his priveledges. In a later scene, he see him harass some black college students he pulls over and even feel up the girl. 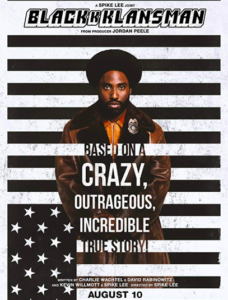 When Stallworth approaches his Captain with the idea of him going undercover, the Captain comes up with an assignment for him…to infiltrate a black speaker’s rally and wear a wire to get on record anything this speaker says that might incite riots. Stalworth goes to the rally and does his job, but the only thing that comes out of it is him meeting a nice girl who is very involved in the cause. This girl is Patrice, (played by Laura Harrier from Spider Man: Homecoming,) and she is the head of the student union, the group that brought this speaker in, from out of town. Now this is the first area where the movie could have done a better job. Granted there’s a little too much if the blaxploitation soul seventies feel in a scene where Ron and Patrice meet for a date and go dancing, but at least that stuff is setting up atmosphere and the time period. Here, with the KKK call, the story seems to be missing a few beats. First, what gave Ron the idea to make the call? Was there a big KKK presence in the area or a recent crime that got him and others interested? And what is the reason why the moment he makes the call abc establishes a connection, the police want to make it into a case? Is there a crime that happened recently that the KKK may have been involved in? What about a cross burning? It just seems strange that the first mention of the KKK comes when Stallworth just picks up the phone and disks them out of nowhere. A man named Flip Zimmerman, (played by Adam Driver,) becomes the face of the investigation, with Stallworth still playing the part over the phone while Flip plays Stallworth when he goes out in public. And slowly but surely, Flip works his way through the inner circles, getting to know these guys in “the organization,” and become s part of their group. This all leads to one of those great scenes with perfect establishment, but not quite enough follow through. The scene has one of the KKK guys, (Felix, the guy who has it out for Flip the most,) bring Flip down to his basement and then attempt to strap him to a lie detector test. And instead of backing away, or trying to reason with this man, or even telling him how crazy he’s being, Flip just keeps egging this guy on. He is literally trying to rile the guy up, as the man holds a gun to him. The build-up is definitely real. Everything seems to be escalating towards some kind of s fight. And then… the fight never comes. The scene is ended abruptly by Ron, (who is listening in from his nearby car,) and decides to do something to put a stop to it. But if that moment doesn’t have the right amount of follow through, then there’s one that comes even later in the movie which has definitely got it beat. Flip and Stallworth are at a KKK initiation ceremony, sitting around a table for a meal. And suddenly, one of the guys is on to them and starts telling others. And we can’t wait to see what happens and how these guys get out of it. But just then there’s a sudden phone call that comes at the exact right moment to bail our characters out. Talk about an ex-machina. The good thing… the movie is smart enough to hide these semi-letdown moments, by giving us something else exciting to replace them. The scene in the basement room ends with gunshots being fired in the street. And the scene in the dining room ends with our characters speeding away towards the scene that will be the climax of the film. In these ways, the movie hopes that we don’t notice the previous scenes were letdowns, because we are so busy and focussed on what’s coming next. The movie takes the time to show us things that other films might not, including Felix and his wife in bed together, plotting, or what ends up happening to that racist cop from earlier on. And it’s nice that it fills in the gaps on these other things to give us more of a full picture, but the ideas that it leaves out seem like pretty obvious mistakes. Another one has the current leader of this KKK chapter, a man named Walter, propose Stallworth as the new leader who will replace him. What? Stallworth is brand new to the organization. He doesn’t even have his membership card yet, (or maybe he just got it.) Luckily, all of the other members who Walter proposes this to have the same reaction, claiming that this idea is completely ridiculous. But it’s ideas like that, which don’t seem to be grounded in enough merit, that drive little holes into this movie. it’s still a good film, and plenty interesting, but there enough moments where something feels missing, to make what could have been a great film into simply a good one.